What do you get if you cross a British rock band, a stylus, a Hollywood movie director, a Korean electronics company and a mobile device big enough to sink an ocean cruise liner? Yes, that’s right, you get a truly cringe worthy Samsung Super Bowl commercial. The ninety second advert which was aired during last night’s Super Bowl XLVI proved difficult watching as it introduced the company’s new Galaxy Note smartphone (phone tablet?) which is packing a 5.3 inch touchscreen and comes with a styles, yes you heard me right, a stylus. After watching the commercial again this morning, I am struggling to decide which is worse, Samsung’s horrible attempt at trying to make a house brick with a stylus seem like a good idea, or ageing pop star Madonna’s mimed X-rated half time performance. The Galaxy Note commercial featured yet another clear jibe at Apple and iPhone users, with the ad boasting "Yes, it’s got a pen!". The included stylus seems to be being pushed as one of the device’s defining features and the statement during the commercial is a clear dig at Apple after former company CEO Steve Jobs once proclaimed "if you see a stylus, they blew it". The new Samsung commercial also features a set of consumers standing in a long line waiting for the release of the device, with one of them complaining "I can’t believe we’re missing the game for this", once again another attack on iPhone fans who loyally queue for each new device launch. The advert last for ninety seconds and was directed by Booby Farrelly who has been involved in popular movies such as There’s Something About Mary and Kingpin. It also features The Darkness; who are a British rock band and haven’t been seen in the public eye for a very long time. 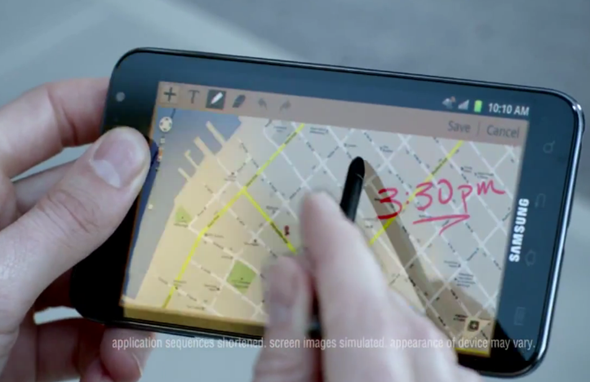 So other than the disappointing commercial, is the Galaxy Note something to write home about? Well, it has a pen, so I guess they blew it.